I’m blogging this in the hopes that anyone else doing Google searches while trouble shooting their tankless water heater might find this info useful, because I couldn’t find any information about this on the web. The other day, our one year old tankless water heater seemed to crap out. No hot water from any taps, and there was a faint smell of gas around the unit. After about 30 seconds, the display blinked 11 and 12, both error codes. 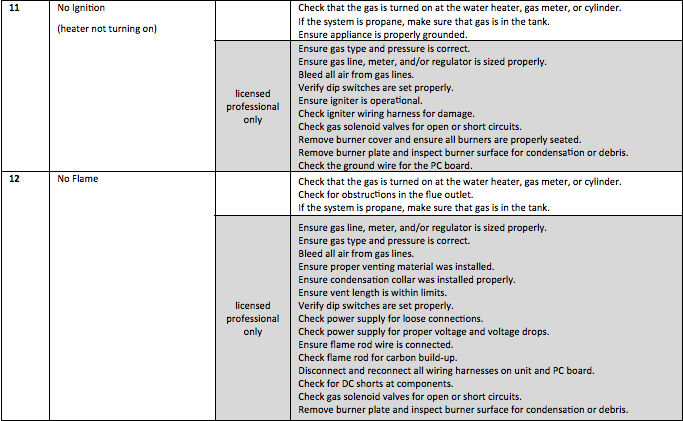 Looking up the documentation on it (it’s a Rinnai RU98i), the error codes correspond to “No Ignition” and “No Flame”, both saying that the burner isn’t firing. The only homeowner tip is to check the gas lines to make sure gas is being piped into the unit. I checked mine and all the gas lines were clear and operating. Additionally it said if you smelled gas to shut the whole thing down and call a professional. Eventually when the plumbing installer came out to troubleshoot, and we figured out the problem: the air intake/exhaust was covered up by masking tape/paper while our house was being painted. No air was going in and none was going out, so the gas smell was due to a backflow of air. So that’s my troubleshooting tip: if your Rinnai tankless water heater ever stops working and spits out error codes of 11 or 12, not only should you check the gas lines to make sure they’re turned on, but also check the air intake/exhaust and any filters you have to make sure the unit is getting adequate new air while being able to spit out older air. I wish the documentation on the unit mentioned that, because I could have saved $150 on the plumber’s visit.